"I think it's time we looked at some of the newer technologies." I can't believe my ears. The Boss buys new kit about as regularly as Thatcher votes Labour. It was his idea to forget this Pentium nonsense and get a job lot of XTs that he could acquire very cheaply. Fortunately I'd got wind of it and managed to 'accidentally' let slip to the CEO that the vendor was in fact the Boss's second cousin and the plan was abandoned. Quite right too - I can't believe he didn't include my mark-up in the equation. However, since his spell on the hell-desk the Boss is a new man. His mind is permanently alive to the possibility of a scam. "There's a research lab having an open day," he said. "I think you should go along and see what's new." Actually, he may have said "steal what's new" - it's hard to tell since his recent bastardisation. A few days later, the PFY and I find ourselves on a train at an unearthly hour of the morning chugging through the countryside with the trusty false-bottomed suitcase at my feet. We finally make it to the concrete research-park jungle and into the show. As luck would have it, we're given a reconnaissance mission - sorry, guided tour - before being let loose to find our own way around. The tour is boring but at least the guide is too thick to see what we're up to. Eventually we're left to our own devices (and some of theirs that haven't been bolted down). It's interesting to see the mass of toys scattered round, but my attention is drawn to the myriad security staff lurking around the areas where the smallest and most expensive gadgets live. The first section seems to be about teleworking, something I relate to since the Boss paid for SMDS to my living room. "So, tell me about teleworking," I say enthusiastically to the young suit on the ISDN gizmo stand. "Well this unit enables you to connect invisibly to the office from home. All the network protocols go down the line, looking just like you're connected to the LAN," he gushes. "Looks like an ISDN router to me." "Er...yes it is. But it does have a nice blue box and extra flashing lights." I look at the box disdainfully - not even worth nicking. "Anything else you'd like to try to convince me is new?" "Well, we have a router on a PCMCIA card." "So you can connect your laptop to the office network via a router rather than a dial-in server." 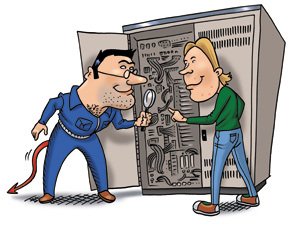 "So that you don't have to install a dial-in server beside your routers." "Of course. Using an expensive router instead of a cheap dial-in server. How economical." My musings are interrupted by a nudge from the PFY. "They've got an iris-reading authentication system like ours." "Not quite - ours doesn't do semi-permanent damage to eye tissue and isn't linked to the sprinkler system like theirs is." There's still so much for him to learn. The lunch is much better than expected, mainly because we skipped the canteen and slipped into the VIP eating area instead. The card reader takes mere moments to fine-tune so that it will accept our business cards. Watching real VIPs attempt to gain access afterwards makes interesting lunchtime entertainment, while ensuring that seconds are available. Suitably fortified by the chateaubriand and the rather decent claret we are ready to tackle the rest of the exhibition. The false bottom of the suitcase is only heavier by a bottle of excellent Cognac carelessly left locked in a liquor cabinet. Our progress is impeded by one of the security droids. While he's telling me why we have to wait for access to the good stuff, the PFY slopes off through the shadows. Section six suddenly opens way ahead of schedule, allowing us to see this power-free optical cell device. "...so as you can see, there is no power cable to the base station," drones the techno-bore on the stand, obviously trying to figure the intense interest in the video stream that's going down this seemingly power-free network gizmo. "As you can see, we've put a gap here in the fibre, so if I put this piece of card in the gap it'll cut the stream off to prove that we're not cheating." He places the card in the gap and turns to the screen for the first time to smugly point at the frozen image. His expression turns into that of a man who has just encountered a water buffalo in his jacuzzi. "Debbie Does Dallas. Nice touch," I congratulate the PFY. Halfway to the corner pub, all hell breaks loose. Klaxons, fire engines, people running from buildings, the whole caboodle. The PFY's puzzlement is directly proportional to my smugness as I adopt a leaning position at the bar. "No bet," the PFY replies. "Pint?"